↑ Sato N (2004). "Roles of the acidic lipids sulfoquinovosyl diacylglycerol and phosphatidylglycerol in photosynthesis: their specificity and evolution". J Plant Res 117 (6): 495–505. ↑ Spraque SG (1987). "Structural and functional organization of galactolipids on thylakoid membrane organization". J Bioenerg Biomembr 19 (6): 691–703. ↑ Benning C, Xu C, Awai K (2006). "Non-vesicular and vesicular lipid trafficking involving plastids". Curr Opin Plant Biol 9 (3): 241–7. ↑ Mustardy, L., Buttle, K., Steinbach, G.G. (2008). 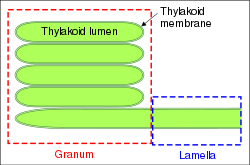 "The three-dimensional network of the thylakoid membranes in plants: quasihelical model of the granum-stroma assembly". Plant Cell 20 (10): 2552–2557. ↑ Westphal S, Heins L, Soll J, Vothknecht U (2001). "Vipp1 deletion mutant of Synechocystis: a connection between bacterial phage shock and thylakoid biogenesis?". Proc Natl Acad Sci USA 98 (7): 4243–8. ↑ van Wijk K (2004). "Plastid proteomics". Plant Physiol Biochem 42 (12): 963–77. ↑ 13,0 13,1 Friso G, Giacomelli L, Ytterberg A et al. (2004). "In-depth analysis of the thylakoid membrane proteome of Arabidopsis thaliana chloroplasts: new proteins, new functions, and a plastid proteome database". Plant Cell 16 (2): 478–99. CS1 održavanje: Eksplicitna upotreba et al. (link) - Baza podataka "The Plastid Proteome"
Ova stranica je zadnji put izmijenjena 22:33, 13 april 2017.